There are several models of the Shure-Step that can be made like this for helicopter use with this unique radius cut away at the bottom of the step that allows the step to fit right over the skid. They are the 6 inch high Senior Step, The 10 inch high Shure-Step II, the 2 Step Stool and the Shure-Step III. This step stool is super cute! I’ve been wanting to get one for my son but can only find the cpehay plastic ones in the store or ones that I can’t imagine spending as much as they are asking for! This seems like a great fit! Ma’am thank you for a positive remark on our product. 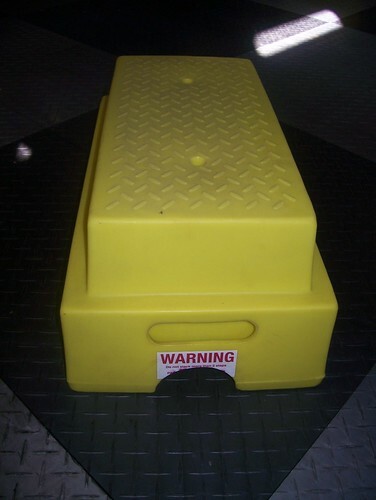 We have many videos on ShureStep Step Stool usage especially for Helicopters. This photo http://www.flickr.com/photos/shurestep/6344917548/in/photostream in our flickr shows another design of ShureStep for Helicopters. You can choose from any of our ShureStep Step Stools here http://www.shurestep.com according to your needs. I’m sure you will enjoy browsing our different designs and hope we can serve you well.